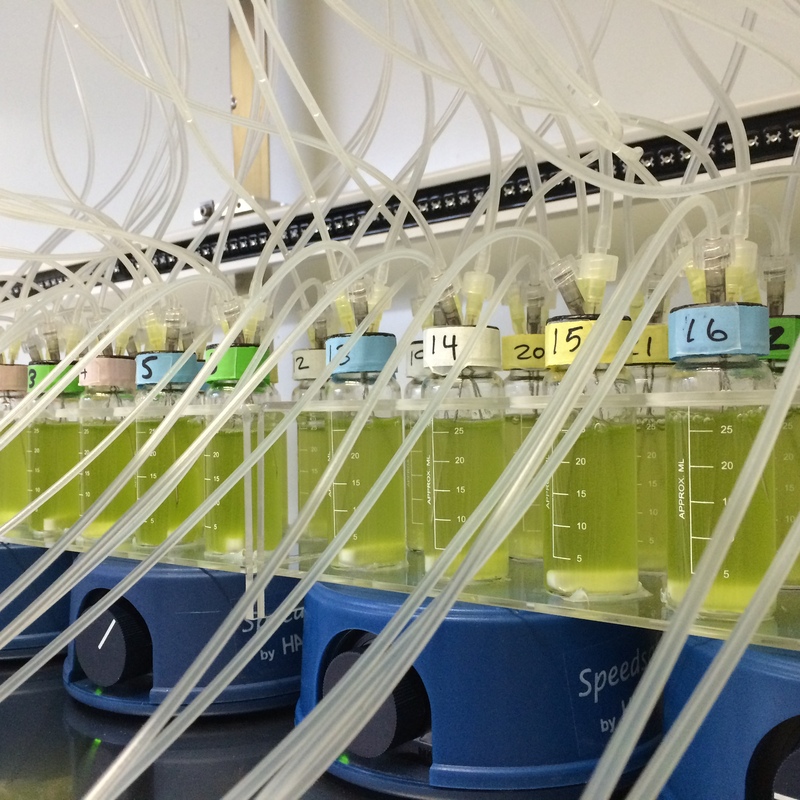 We combined the use of an evolution experiment in chemostat and proteome expression studies to explore how metabolism evolves in response to essential resource limitation in phytoplankton. It started with the idea of zooming in with respect to evolutionary time – WAY IN. It had been a few years of investigating how well evolutionary distance among species of phytoplankton predict the way in which they interact, and specifically, how strongly they compete for resources. The signals of prior evolution, however, seemed to have all disappeared. Phylogenies quantifying evolutionary distances among species were not helpful in predicting the strength of their competition, or the differences in their competitive traits. Maybe such phylogenies represent far too much evolutionary time to be useful for organisms that can evolve rapidly? So perhaps we needed to zoom in in evolutionary time, to observe how traits related to resource limitation and competition evolve in real time. The clearest way forward was to start from a single common ancestor and run the experiment of evolution from day 0. In this experiment, published in Nature Communications, we worked with the well-known model green alga, Chlamydomonas reinhardtii. We chose this lab-rat because of the vast genomic, evolutionary and physiological resources which have accumulated on this taxon. This inspired our nickname for the experiment “ChlamEE” - or Chlamydomonas Experimental Evolution. This is the best-studied eukaryotic alga on earth, and without the contributions of generations of scientists, it would have been impossible to study the evolution of metabolism and protein expression of the species. After selecting a well-known strain from the Chlamydomonas Collection, and receiving it in the mail, it was time to pick colonies. We selected 4 separate colonies from agar plates, each one representing a single genotype, and put them into liquid culture. This resulted in 4 clonal populations as well as the original genetically mixed population with which to begin the evolution experiment. It was important to run the evolution in stable, homogenous environments, for which we had to build chemostats. After a few conversations with chemostat experts, Nelson Hairston and Martin Ackermann, we decided that a traditional glass-blown chemostat design was overkill for us – both in volume and in cost. So, we decided to ‘MacGyver’ our chemostats out of scintillation vials, heavy-duty, high-gauge syringes and stir-bars. This took a while to get the hang of, but within a few weeks of trial and error we were ready to go. Maintaining an evolution experiment for 285 days in 35 chemostats required close attention to detail, verging on paranoia! We started by sterilizing an entire climate chamber. From here on in, only people working on the experiment were allowed to enter the chemostat room, and suitable attire included plastic footwear coverings intended for surgeons, and fresh lab coats. All materials got cooked in the autoclave, UV sterilized, or ethanol-wiped, before the experiment began – and this level of hygiene was maintained throughout. A small team performed daily checks to ensure tubes were not clogged, air filters were dry, stir-bars kept stirring and the pumps kept replacing media. Any replacements of tubes or filters were performed with surgical precision. After 285 days of selection under different types of resource limitation, we harvested the “Descendants” of ChlamEE. We were finally ready to start investigating how they had changed over this relatively much shorter evolutionary time. This meant taking all of the Ancestors and Descendants and growing them up in a “common garden", i.e. standard, non-stressful conditions - which we sometimes referred to as the steak and potatoes for algae. After a few generations of growth in these common garden conditions, we were ready to extract and characterize protein expression, in order to see how their metabolic traits had changed. After months of work on an LC-MS, we were left with an enormous protein-abundance dataset. Thanks to our past experience with next-generation DNA sequencing, seeing this mountain of data made us excited rather than intimidated. 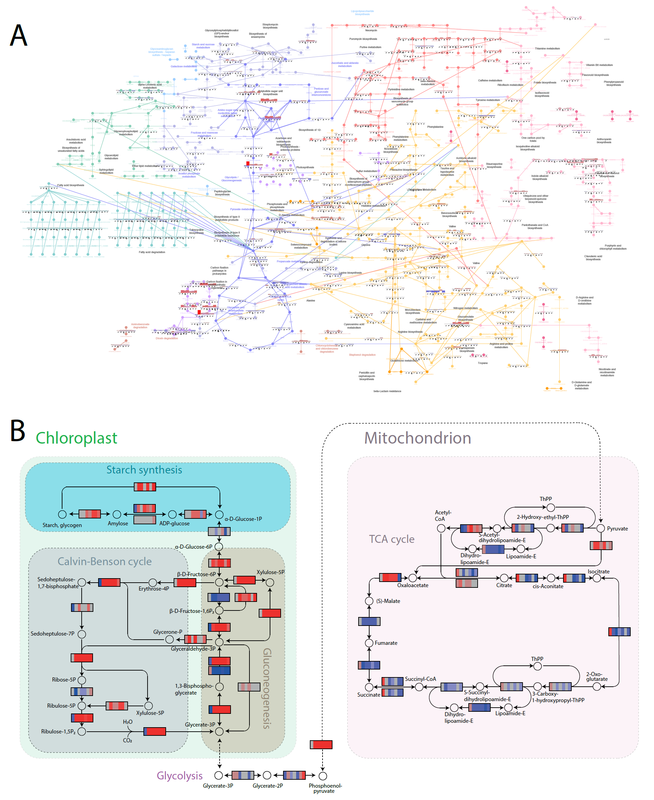 Making sense of the data was greatly facilitated by the excellent genomic resources available for Chlamydomonas reinhardtii, including a high-quality reference genome as well as annotation for several parts of the genome. Quite unexpectedly, the biggest difficulty we faced was how to explore and visually present the metabolic context of our findings. We had studied several papers which reported metabolic network figures similar to our Figure 4, and naturally also reported the software used for preparing these figures. However, the default output of any of the visualization software we tested produced something more like A (below) than our final version, B (Fig. 4 in Tamminen et al. 2018, released under CC BY 4.0). We ended-up preparing the final figure by using a combination of Pathview from Bioconductor and manual editing in Adobe Illustrator. In the end, we overlaid the metabolic maps from Pathview onto our own vector drawings, combining the separate relevant parts of the metabolic maps from Pathview. This combination of automatic mapping and manual artwork eventually resulted in a metabolic map that we were all happy with.